Priyanka Chopra and Nick Jonas, who have been dating for a while confirmed their plans to marry after their roka ceremony on August 18, 2018. 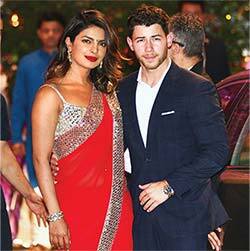 Priyanka and Nick had a traditional engagement ceremony before their families, which was followed by a grand party into the night. Chopra shared photos of the morning ceremony on her Instagram profile. The couple will reportedly tie the knot soon, though there have been no official reports of dates. The engagement ceremony took place after a puja was performed at Chopra’s home. Jonas’ parents accompanied him to India for the ceremony. Jonas and his parents left for the United State the next day. During their four day trip to India, they visited Priyanka Chopra’s old house and also spent some quality time at an orphanage. The gorgeous couple looked very much in love as they celebrated their engagement. Nick posted a simple message. . .”Future Mrs. Jonas,” “my heart” and “my love.” He wore a formal sherwani outfit for the occasion and Priyanka also donned traditional attire. Madhu Chopra, Priyanka’s mother, and her brother proudly posed with the couple, as did Nick’s parents. The Chopra family posed alongside Jonas family. The roka is the first ceremony of Priyanka and Nick’s Indian wedding. Sources indicate Priyanka Chopra would like everything to follow Indian styles and traditions to respect the values of her family, and certainly those of an Indian wedding. Now, the whole world is eagerly waiting for their marriage ceremony.